Founded in the ’80s by John Rubright. 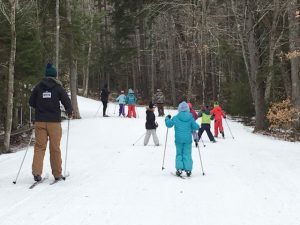 Every Winter the Rikert Nordic Ski School works in conjunction with local Elementary Schools to teach hundreds of kids to Nordic ski and snowshoe. 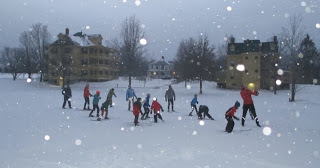 Our goal is to develop happy, self assured, lifelong skiers and snowshoers. At Rikert we embrace and work with the natural curiosity of children, focusing on a playful, creative and relaxed approach to learning. Lessons often begin by playing games in the field. Games help kids to be comfortable on their skis. Nimbleness, coordination, and agility are some of the results of game-playing. Among the favorites are Simon Says,Tag, and Sharks & Minnows. With guidance, enthusiasm and a progression of skill-building activities, children learn to ski. There really is no better way to enjoy Winter than to just get outside and play. 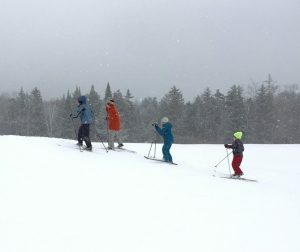 Any winter activity is part of a healthy lifestyle and Nordic adventures are fun for the whole family.